Are you that bride who wants to get married with all the traditional trimmings, but who wants to add a special touch? EMBI can do something special for you! As you can see from the photograph I composed my own bridal bouquet using silver plated natural flowers. A unique product bound in a traditional way. My bridal bouquet is a lasting decoration that I keep looking at with pleasure. And at my wedding anniversary this bouquet still decorates the dinner table every year! 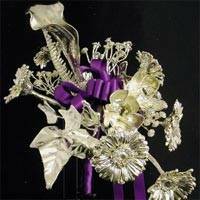 In consultation with you we can make a composition of silver plated or gilded flowers and fashion it into a bridal bouquet exactly to your taste and liking. It is therefore not possible for us to quote a standard price for this unique product. The price depends on the type and quantity of flowers used in the bridal bouquet. To get a rough idea, you can think of prices in the range of € 1000,00 to € 2500,00. It may seem expensive, but you really have something very special!